The GL553 is aimed at budget-minded gamers. Equipped with Nvidia GeForce GTX 1050, the GL553 won't offer the same gaming performance as it's bigger brothers. Even at the lower price, however, the GL553 still has most of the component found in more expensive siblings, including a solid build and a full RGB keyboard. The GL553 sports an Intel Core i7-7700HQ, an Nvidia GeForce GTX 1050, excellent build quality with a DVD drive, an RGB backlit keyboard. 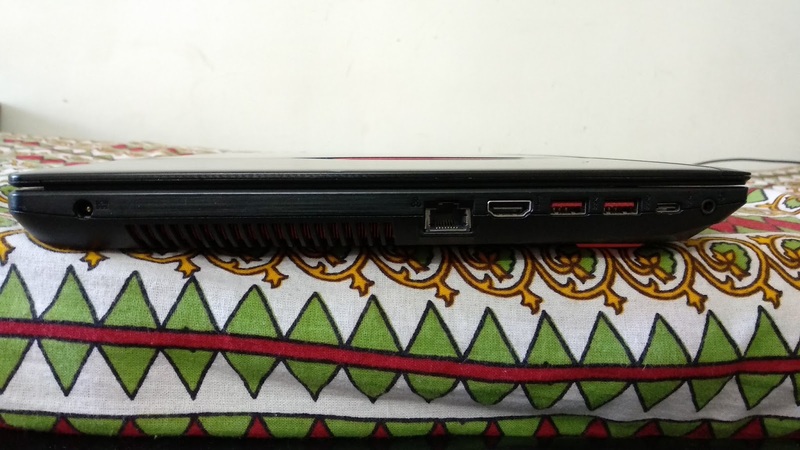 A hallmark of the Asus Strix line is its build quality, and the GL553VD is no exception. The exterior of the lid is covered in a black brushed aluminum finish, with a bright orange ROG logo that lights up when the screen is on. The aluminum lid is also a fingerprint magnet; oils and smudges are highly visible and you have to wipe it off properly to maintain it’s look. Every other surface of the notebook is black plastic. However, there are no gaps or seams and build construction is still top notch. The deck also has a glossy faux-brushed metal styling that looks nice. The bottom panel is firm. Overall, the chassis is very well built, especially compared to the competition in this price bracket, the device felt firm, stable, and pleasing to use.The 15.6-inch, 1080p screen on the Strix is sharp and colorful. Display panel produce nice and exact real-life color that it supposed to do. Asus preloaded the Strix with a variety of useful gaming software stuff. 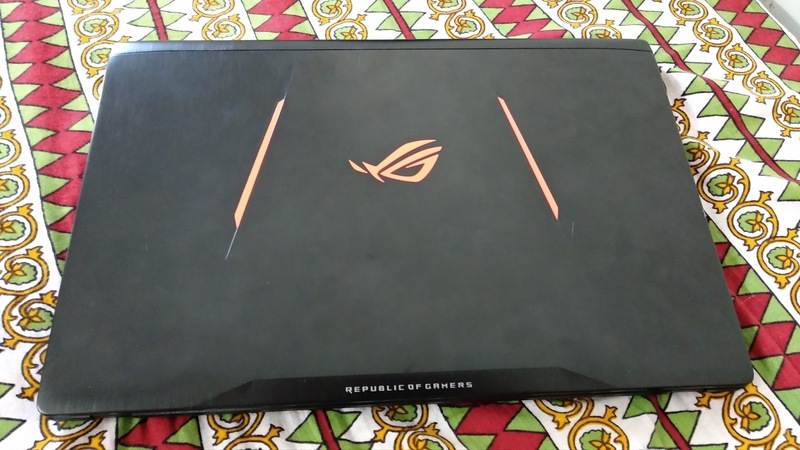 Most notable is the ROG Gaming Center, all you got under one roof, that affect the gaming performance even it including temperature and CPU and GPU memory. It also includes options to boost fan speeds and disable the Windows key while gaming. Other gaming programs like GameFirst IV, lets you prioritize programs and games' access to your network to reduce lag while you play. Asus' Splendid utility lets you control color temperature, and the preloaded XSplit Gamecaster allows for Twitch streaming. Asus sells the ROG Strix GL553 with a one-year warranty. Well for OS level you, it’s get preloaded with Windows 10 in the box, including stream for online gaming experience. Armed with a 2.8-GHz 7th-gen Intel Core i7-7700HQ CPU; 16GB of RAM; and a 1TB HDD, the Strix is a fine multitasking machine. The GL553 is equipped with a top of the line Kaby Lake Core i7-7700 HQ, which is typically reserved for workstation and gaming notebooks. On the Geekbench 3 overall performance benchmark, the Strix notched a score of 13,765, beating the other mainstream-notebook average. It took the Strix 54 seconds to copy 5GB of mixed media files, which translates to a rate of 94.2 megabytes per second. The GeForce GTX 1050 is Nvidia's latest entry in the GPU market. Based on the new Pascal architecture, the GTX 1050 features 640 shader units and up to 4 GB of GDDR5 VRAM with a 128-bit bus. Performance is comparable to last generation's GTX 965M. Power draw is low at around 50 W, but performance remains adequate for 3D tasks. The GPU in our GL553 ran at full speeds whether plugged in or on battery. Compared to its rivals, the GL553 keeps paces with the MSI GL62M and HP Omen 15, which are equipped with the GTX 1050 and GTX 965M, respectively. On the left are a LAN port, an HDMI port, two USB 3.0 Type-A ports, a USB 3.1 Type-C port, and a combo 3.5mm audio jack. The Type-C is only Gen 1, that means external graphics solutions and other peripherals that require high bandwidth will not be fully supported. On the other hand, on right side, we spot only a single USB 2.0 port. The rest of the right side is taken up by the DVD-RW drive. 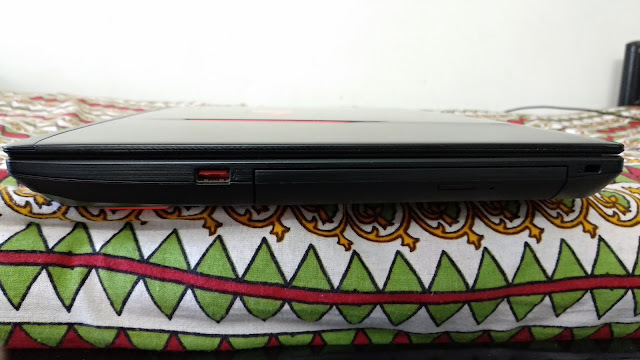 The SD card slot is located up front of the device. To make room for the massive vent on the left side and the optical drive on the right, all other I/O is shoved to the front of the notebook. The Asus GL553 has a relatively small 4-cell 48 Wh battery. The battery is decent for light office work while in Airplane mode but middling for anything else. In our WiFi test, where we set the screen brightness to 150 cd/m2 and run a script that loads a new web page every 30 seconds, the GL553 lasted only 4.5 hours, which is mediocre. Under load, the GL553 gave up the ghost after only 47 minutes. The Dell Inspiron 15 7000 blew our test unit out of the water with more than double the battery time in our idle and WiFi tests. While it is nice to have additional connectivity, the massive optical drive takes up a lot of internal room. This space might have been better utilized for a larger battery, but as it is, gamers in need of a long lasting device for productivity work should look elsewhere. Dell's offering grants much longer operation away from the wall. 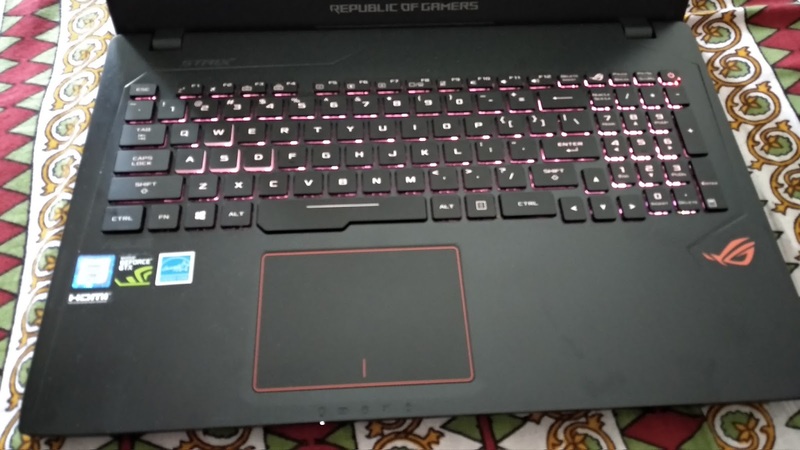 The price Asus ROG Strix GL553 is the most affordable gaming laptop that the company currently sells, and it comes with a comfortable keyboard, a vivid display and an Nvidia GTX 1050 GPU. Even though the base model of the Strix is $1,099, we know there are gaming notebooks with 1050 and 1050 TI GPUs and Kaby Lake CPUs coming this year for less than a thousand bucks. 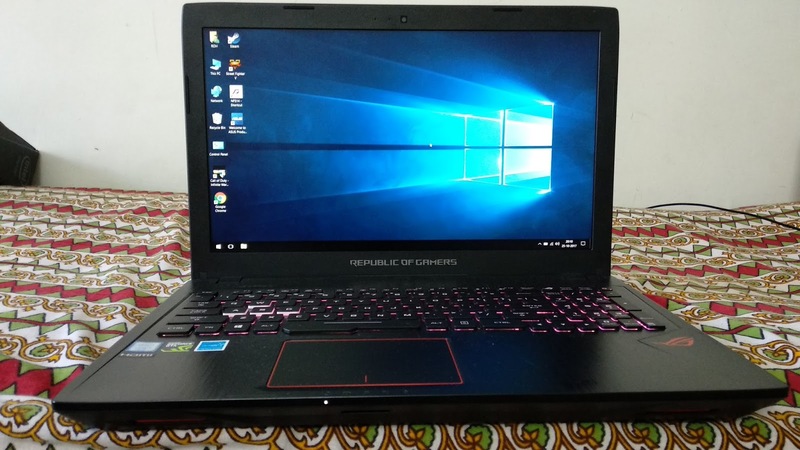 However, if you want an affordable gaming laptop that can play the latest games at medium settings, the Strix is a good option.